Whether you’re a veteran or just a patriotic civilian, the brilliantly colored, limited edition "Forgotten Heroes" Scout Knife is a beautiful, useful tribute to once-sadly overlooked Vietnam Veterans. Proudly designed in the USA by legendary knife maker Kissing Crane, it also makes a versatile, ideal everyday pocket knife, with five handy tools in one compact folder. The razor sharp 2 1/2" drop point blade is forged from tough 440 stainless steel and features a striking Vietnam War-themed etching. "Forgotten Hero; Time Was Served, Time To Honor" is boldly emblazoned in all capital letters on the blade, beside an iconic Vietnam-era Huey helicopter and the dates "1954-1975." The stately folder also boasts a stainless steel can opener, bottle opener, awl and bail. Brilliant yellows, reds, greens and blacks adorn the bone handle scales, the vibrant hues arranged in a pattern that mirrors the hallowed Vietnam War Service Ribbon. Stone inlays and Kissing Crane's classic logo shield are set delicately into the bone handles, flanked by gleaming nickel silver bolsters. At 3 3/4" closed, this handy pocket knife is perfectly sized for everyday carry, while packing enough muscle to take care of practically any day-to-day cutting job. A collector's dream, each scout knife is laser serialized to denote your knife's place in this extremely limited run. Kissing Crane's Forgotten Heroes Scout Knife makes a terrific, heartfelt gift for the Vietnam Vets in your life. It's sure to serve as a touching reminder of fallen brothers and time served and is a great way for vets to proudly showcase their service. You don’t have to be a veteran, however, to appreciate the sacrifice so many brave men and women made in the jungles of Southeast Asia during the 16-year struggle against communist expansion. 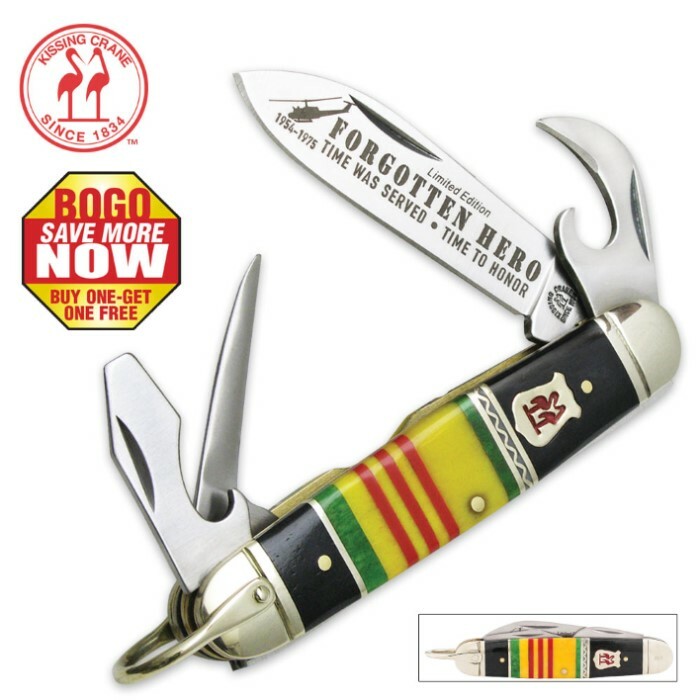 The Forgotten Heroes Pocket Knife is perfect for anyone - young and old, serviceman/woman or civilian. Best of all, it lets any Vietnam vet who sees it know his or her honorable service in the war is not forgotten and still appreciated by ordinary citizens like you. Buy one, get one FREE! If you want a very good everyday handy pocket knife without going broke, these are a deal. A basic "Scout"-style knife. Same blade and tool setup as Boy Scout knives and basic military Mil-K-818 ( "Milk") Utility knives. I'm a strange knife snob. I like good to really good knives at a great price that work rather than the techno-metal of the week overpriced bragging rights collector knives. My knives get used. I've carried some version of these since I was a Cub Scout and my military issue version for 40 years now. On the BOGO these are under $12 each. Well worth it. 40 years ago this blade/tool setup was the original multi-tool. These are not cheap junk, they're well made, with good steel, mine came sharp right out of the box ( I bought two and a week later I've just ordered two more. I like them). Bonus is the Vietnam Service Ribbon color scheme can be very helpful if you drop it....about anywhere. Never carry a camo knife into the woods. These are great first knife for a properly supervised child of the proper age and maturity. And they are a great everyday knife for everyone else. 5 basic tools that are extremely versatile. That nice little awl has been a screwdriver for my eyeglasses more times than I can count. Would I give up my 1982 Schrade mil-k-818 for it? Nope, never, no how. Would I carry one of these out in the woods camping? Yep. Heck I bought 4 of them for handy extra knives. I'm out in the country-country. Born in GA, raised in TN, spent most of the last 25 or so years in nowhere TX. 20 year enlisted military mechanic. I use knives and tools and know what will work and what won't and I love me. These will work. Used properly and for what they were made to do, I well expect these knives to outlast me. Make America Great Again and teach your kids human skills. Everyone should learn how to whittle and cut a string, peel potatoes, and slice dinner.